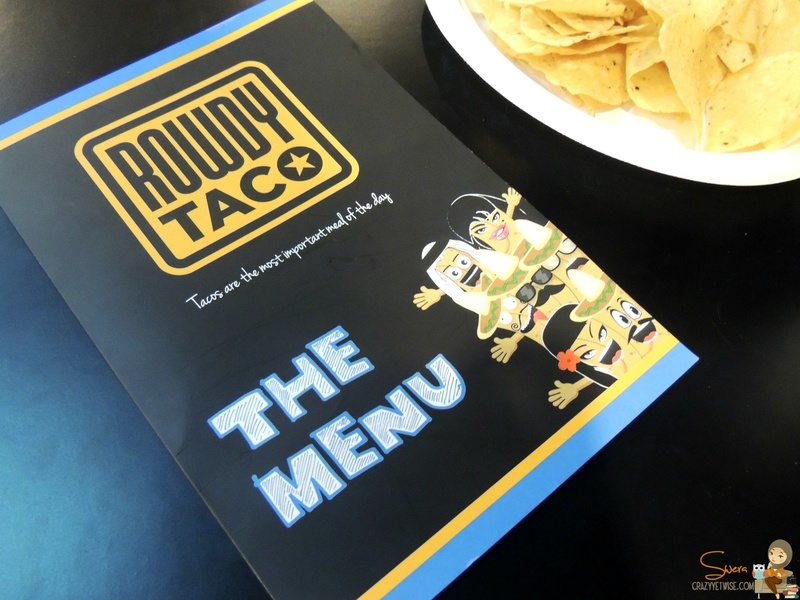 I received an invitation from Kayan Restaurants to visit the newly opened franchise Rowdy Taco which is also known in the US as RustyTaco. It actually opened on the same day (yesterday) without any kind of advertisement but it was crowded & the queue was really long mashallah. I believe it’s because of the location (Alia & Ghalia Towers). Of course the place was filled mostly with Americans & foreigners but also Kuwaitis were spotted there. 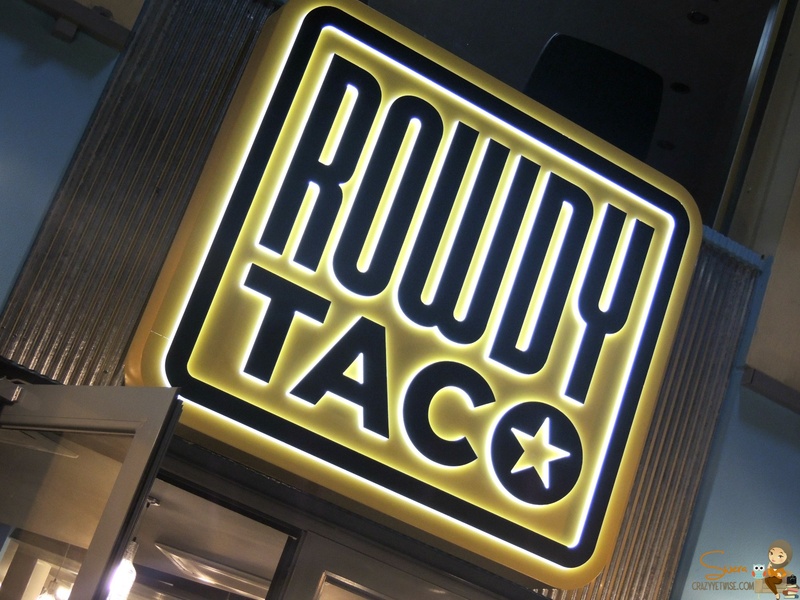 We were greeted by the Mrs. Jillian Marshall who gave a brief idea about the place & explained why they’ve changed the name (RUSTY) 😛 She recommended some tacos to try & said that 1 or 2 tacos won’t be enough, 3 & more will be fine (I was thinking of my diet 😛 ) Luckily, the tacos were really very light (not all but most of them). We were seated outside, the weather was amazing around 7pm. As I said the queue was really long but ofcourse we managed to get our order immediately 😉 My dad & I tried many kinds of tacos (pictures below), most of them if not all were really good & tasty. Verdict: Loved the Chili Con Queso & Guacamole alot. Chili Con Queso is a mixture of white & yellow cheeses, so delicious. 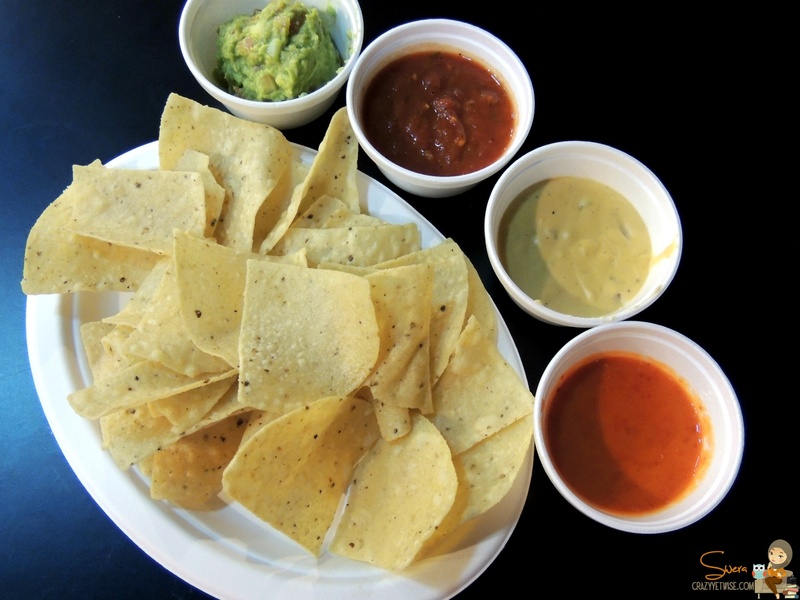 The salsa was like any other salsa & I haven’t tried the spicy one because I’m not that close to spicy food. 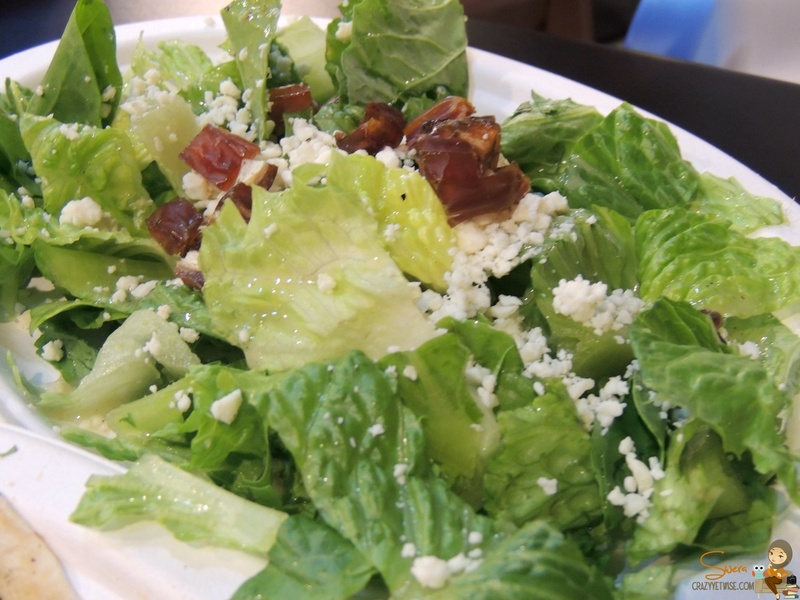 Ingredients: Mixed greens, cotija cheese, dates & pumpkin seeds with cilantro vinaigrette. Verdict: Loved the mixture (I’m loving the dates in salads these days). The sweetness of the dates & the sourness of the cheese & vinegar created a wonderful taste. Ingredients: Grilled poblano mushrooms, onions and red peppers topped with queso fresco & cilantro. Verdict: If you’re a vegetarian then this is your taco. Really good, the cheese was very delicious. 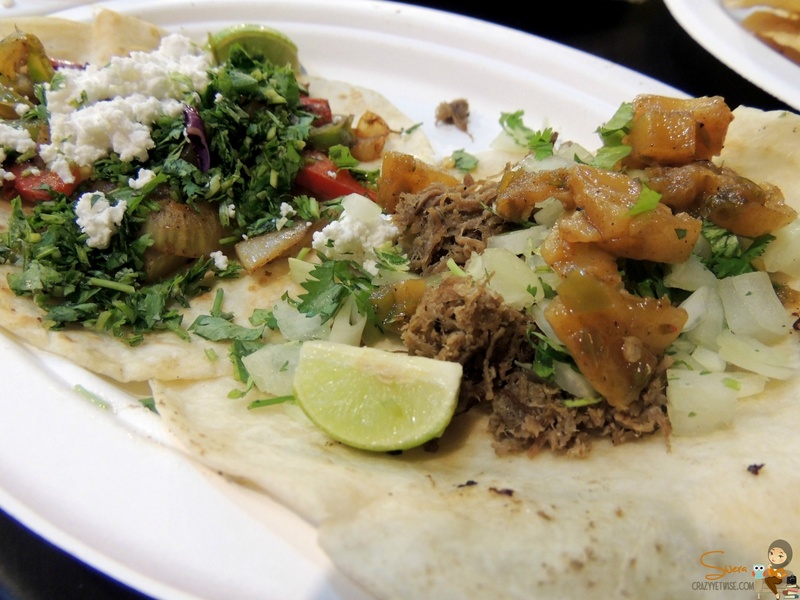 Ingredients: Achiote rubbed lamb with grilled pineapple, onion & cilantro. Verdict: mmmm I’ve always liked the combination of pineapple & chicken but with lamb!!! Didn’t like it that much. Maybe others will. 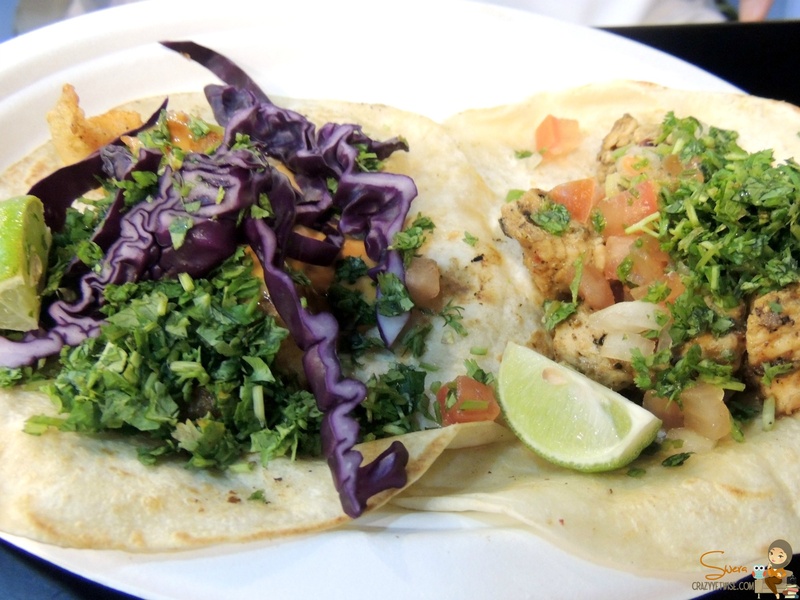 Ingredients: Crispy fish with chipotle crema, red cabbage & cilantro. Verdict: Oh My My,,,One of the best tacos offered in the restaurant. So delicious & yummy. A lil bit heavy because of the sauce but the portion of taco was good. Loved it & it’s HIGHLY RECOMMENDED. Ingredients: Chicken with Pico de gallo sauce. Verdict: It was good but very spicy. Was able to take one bite only (really hot) but my dad loved it. Ingredients: Crispy shrimp with creamy baja sauce, red cabbage & cilantro. Verdict: Heavenly delicious. 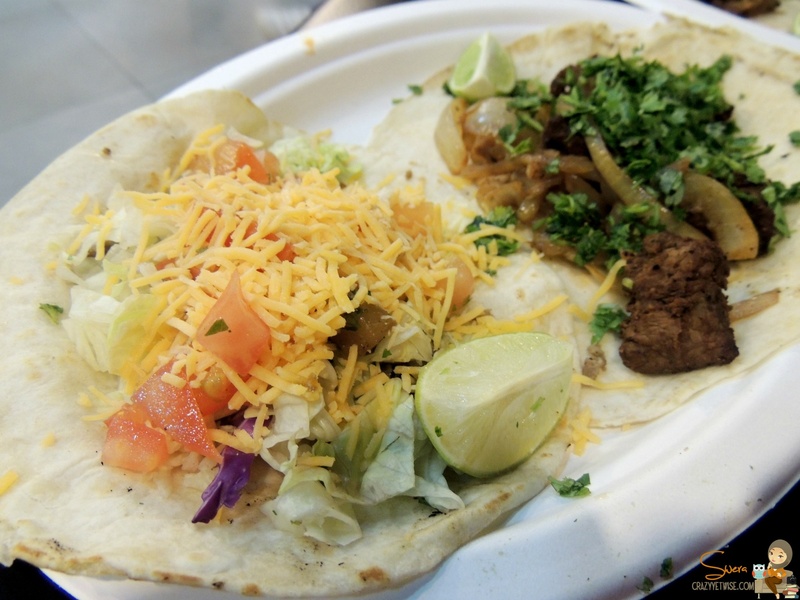 This is also one of the best tacos offered in the restaurant. HIGHLY RECOMMENDED. Ingredients: Spicy tex mex ground beef, lettuce, tomato & cheese. Ingredients: Beef with grilled onions & cilantro. Verdict: It was ok, I guess it needed more sauce or maybe it should have been a lil bit juicy. My husbands meat was very overcooked to the pt where it was dry. My fish tacos were greasy and lacked toppings. that’s really unfortunate! Did you talk to the manager? Hope the owners would see your comment & take immediate action! @jessicalovestorun Oh no! 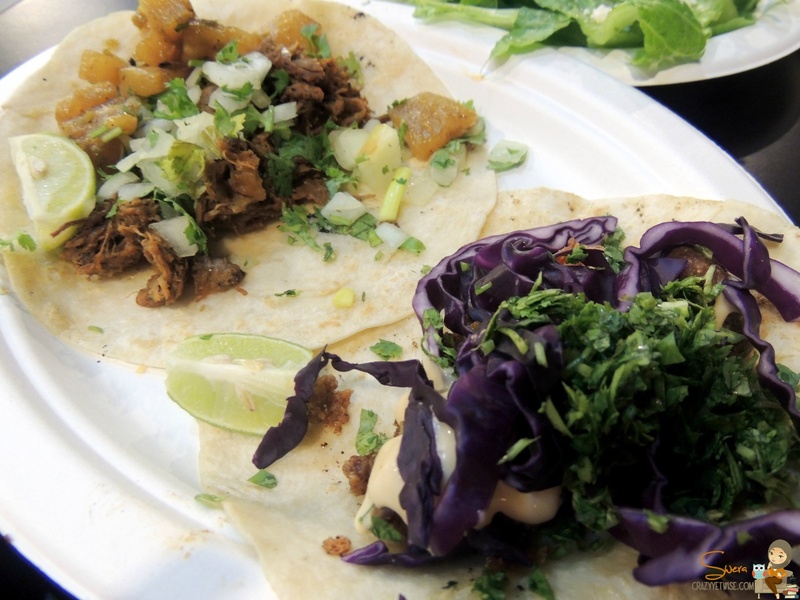 We hate this was your experience and sure wish we could have corrected the tacos then. Please allow us one more moment of redemption. We invite you and your husband back to taste the rest of the menu, on us. Please email j.marshall@kayanrestaurants.com to arrange. We were a little swamped that night so unfortunately I wasn’t able to have a better camera on me, our review had really crummy photos. Your photos alone made all of the food look really nice though! Also, kudos on having the guts to try the shrimp and fish tacos! I usually love fish tacos, but since everything was so hectic we were worried that they wouldn’t come out as good. Over all what did you think of the restaurant? We really wanted to like it but were not left very excited about it..
Yeah, the opening was really crowded, like way too crowded so I wouldn’t be surprised if they did a mistake or two. I liked the restaurant but not all the tacos! As you’ve read in my review, some i liked & some I didn’t! “Americans and foreigners…” Just wondering…. aren’t Americans foreigners too? Wow, so this sentence from the whole post made you wonder? Well, let me elaborate; yes Americans are foreigners but I deliberately mentioned them because this restaurant is an American one so obviously AMERICANS will visit it & I also mentioned foreigners because there were lots of other nationalities dining at the place but AMERICANS were the major diners!